Meet the family: the full Komplete 7 line-up. Leaving aside DAW packages, Native Instruments' Komplete is just about the most comprehensive bundle of music production software you can buy, and the version 7 update has just been announced. This brings together the latest versions of all the existing members of the Komplete family, while adding several more products, five of them brand new. These are Reflektor, a convolution reverb; Reaktor Prism, a modal synth that was designed by NI founder Stephan Schmitt; Traktor's 12, a suite of performance effects lifted from NI's DJing application; Vintage Organs, a collection of electromagnetic organs; and Rammfire, an amp emulation that was developed with Rammstein guitarist Richard Z. Kruspe. Other additions include Abbey Road 60s Drums, The Finger, Scarbee MM-Bass and Vintage Keys, the Classic Piano Collection, Acoustic Refractions and Reaktor Spark. And remember, this is just the new stuff: the likes of Absynth, Battery, FM8, Guitar Rig, Kontakt, Massive and the forthcoming Reaktor 5.5 are still present and correct too. Komplete 7 will be released in September priced at $559/€499, with updates for Komplete 2-6 owners costing $229/€199. Furthermore, anyone who buys the bundle will get a $60/€50 voucher for use in the NI Online Shop. 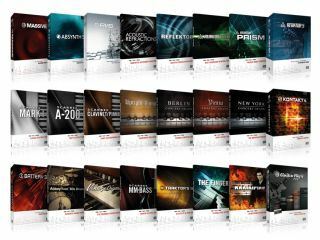 NI has also unveiled Komplete 7 Elements, which contains cutdown 'Player' versions of several of the company's products and sounds from others. It's designed for those who just want instruments and effects without all the in-depth editing - it comes with over 2,000 sounds and 12GB worth of samples. Komplete 7 Elements will also be released in September, though at $119/€99, it'll cost significantly less than its big brother bundle. Once again, a $60/€50 NI voucher will be included.